Inspired by favorite stories of my childhood, Henderson is a "collage of characters". Of the many creatures who intrigue me, rabbits have always been my favorite. Brer Rabbit of Uncle Remus, Uncle Wiggly, The White Rabbit of Alice in Wonderland as well as the German Easter rabbits have all added inspiration to my work. 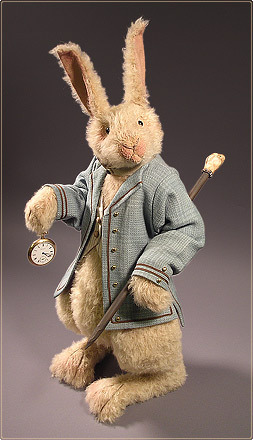 Henderson is a "sculptural", free standing hare, while jointed and poseable he prefers to stand silently talking in all that goes on around him and not mussing his "Sunday Best" wool coat.